Similar styles of processed dishes can be found dating all the way back to pre-Roman times. The modern equivalent of scrapple was first introduced to the Philadelphia area by German settlers back in the 17th or 18th century. 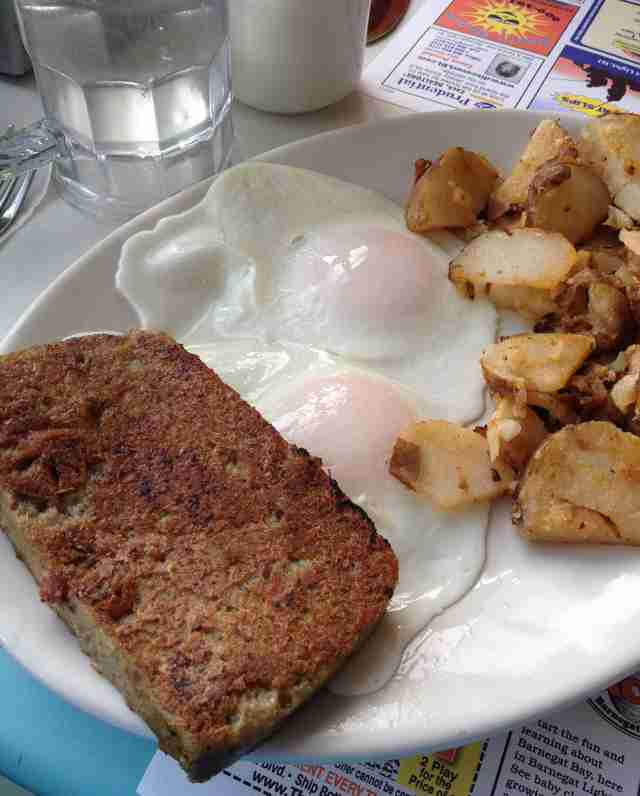 The name "scrapple" most likely originated as a shortened version of panhaskröppel, which stems from words panhaas or panaas (“pan rabbit”) and skröppel (”a slice of”). Translated, panhaskröppel is a slice of panhaas. Since that’s both gross and hard to pronounce, over time it was simplified to scrapple. Originally located in Media, Penn., Habbersett Pork Products first started selling scrapple to the masses in 1863, and you can still get that same product -- with some minor recipe tweaks -- in stores today. 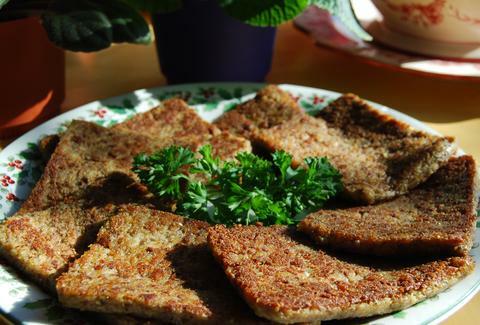 Traditionally, scrapple is made with buckwheat flour, which helps thicken the meat mixture and add flavor and nutritional value. But it's also responsible for that unappetizing gray color that accompanies the best, most traditional versions. Just like your grandma’s apple pie, scrapple recipes are highly protected. But the basic recipe is nearly the same across the board -- boil an assortment of pig scraps (including the nasty bits) to make stock, add in a mixture of cornmeal, buckwheat, and spices until you have a slurry, and then add back in the now-chopped pig parts into the mixture. Cook for a long time and set it in a pan until you are ready to slice and serve. Not exactly grandma’s apple pie, right? 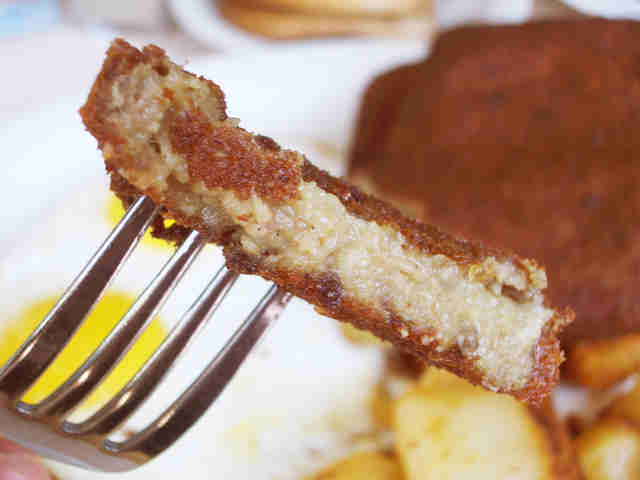 While Philly may lay claim as the official hometown of scrapple, other cities have their own regional specialties that strongly resemble it: goetta, made with ground meat and oats, is popular around the Cincinnati area, as is livermush (mmmm!!!! 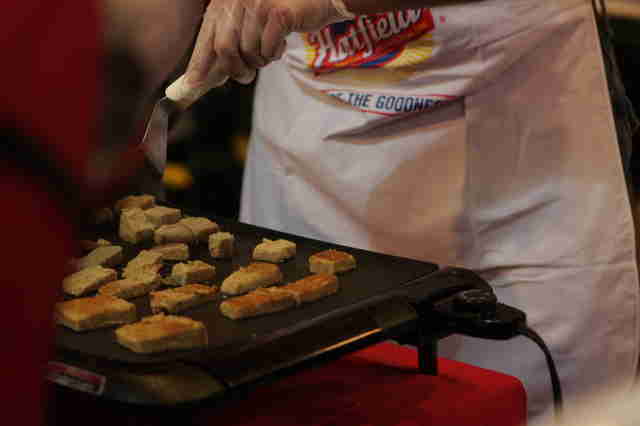 ), scrapple’s liver-laden cousin popular in the South. Remember the recipe above? By the time it hits the pan, scrapple is fully cooked. You could eat that stuff "raw," like dumping SPAM out on a plate directly from the can (mmmm!!!!!!!!!!). But we like it best when it’s nice and crispy. Yes, you read that correctly. Now in its 25th year, the Apple Scrapple festival in Bridgeville, Del. -- a short two-hour jaunt from Philly -- celebrates all things scrapple and apples and attracts more than 25,000 visitors each year. ... which goes to show that there is a national holiday for everything. Possibly an urban legend, but the story goes that in 1879, a man named Rasher Liverburg -- a union member at Philadelphia’s Panhas Packers -- proposed a day in September where all the company’s workers get the day off to enjoy the scrapple they were producing. “Enjoy Your Scrapple Labor Day” soon become a yearly tradition at the plant. Eventually, the idea of a yearly day off of work spread, and Labor Day became an official US holiday in 1894. Dan McKay wasn’t born in Philly, so like the rest of the country, he thinks scrapple is all sorts of nasty. You can follow him on Twitter or Instagram @dannypageviews.